Ring wear and loss may have important consequences for mark-recapture studies that aim to estimate survival trends. Our study quantifies the rates of wear and loss from a long-running colour-ringing project of the Eurasian Oystercatcher (Haematopus ostralegus) in the Netherlands. Our analysis included 8909 colour-ringed oystercatchers with 118,071 resightings, predominantly ringed and observed by citizen scientists. 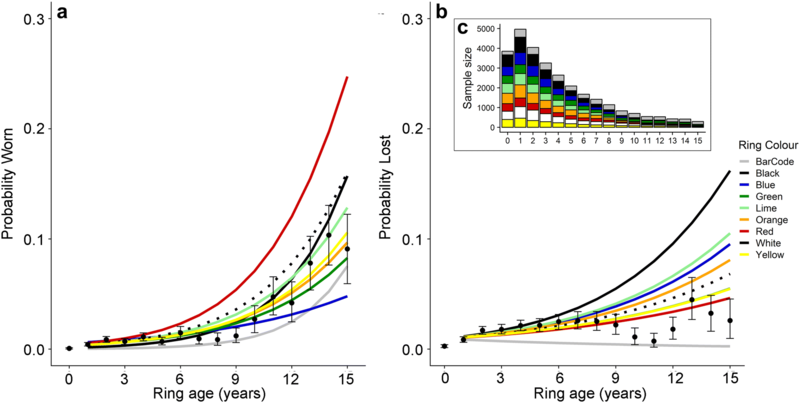 We quantified how ring wear and loss may vary with ring colour and age, and how this may impact resighting probabilities. We then determined how ring loss may impact survival estimates and resighting probabilities of mark-recapture models by simulating four scenarios of how citizen scientists may resight and report birds with lost colour rings. Annual rates of colour ring loss averaged 2.5% compared with 1% for ring wear, but lost rings also had a higher reporting probability (31.2%) than worn rings (10.3%). Lost rings may not directly impact survival estimates since 50% of oystercatchers with lost rings could still be uniquely identified. Ring wear and loss rapidly increased between 10 and 15 years after ringing. Rates of ring loss were comparable amongst ring colours, but the wear rate appeared higher for red and white rings compared to other colours. Rates of ring wear and loss varied significantly amongst different regions in our study, which were characterised as having different habitat features. Differential rates of ring wear may have important implications for studies conducted over large geographical scales or of multiple species. Based on simulations of ring loss in our population, estimates of apparent survival may be 0.3–1.2% lower whilst the impact of ring wear was deemed even lower. We developed a table of recommendations containing advice for ring fitting, data collection, study design, and mark-recapture analyses, so that future colour-ringing studies can benefit from our experiences in collecting and analysing data of ring wear and loss through citizen science. The online version of this article ( https://doi.org/10.1186/s40657-019-0151-z) contains supplementary material, which is available to authorized users. Birds have been equipped with rings for over a century which has yielded a number of insights into their migratory patterns and longevity (Kennard 1975; Berthold et al. 2001; Clark et al. 2009). Analytical developments in the last few decades, principal among them mark-recapture analyses, have enabled more detailed studies of survival and how this might vary over time or space (Seber 1986; White and Burnham 1999). A challenge with bird ringing studies is that the number of resighted individuals is often very low, especially when birds have only been fitted with a metal ring. Individuals with metal rings are often only found after death and sample sizes of dead recoveries may be less than 1% of the ringed population (Robinson et al. 2009; Walker et al. 2015). 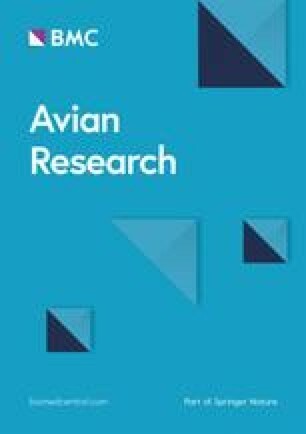 Researchers have also fitted birds with colour-rings which provide an individually recognisable mark that can be read from a distance without the need to recapture the birds (Robinson et al. 2005; Meissner and Bzoma 2011). Colour-rings have enabled researchers to drastically increase sample sizes, especially with recent developments like websites or smartphone apps that make it much easier for citizen scientists to report observations of colour-ringed birds (e.g. BirdRing smartphone app, www.birdring.nl; CR-birding, www.cr-birding.org). The larger sample sizes and spatial coverage of resightings enable more detailed studies into the migratory characteristics of a species and how survival may vary in space and time (Pigniczki et al. 2016; Wood et al. 2018), knowledge that is vital for effective conservation and management (Runge et al. 2014; Allen and Singh 2016). Although colour-rings may lead to a larger number of resightings, resighting data may contain several sources of bias in a mark-resighting analysis (Bearhop et al. 2003; Milligan et al. 2003; Mitchell and Trinder 2008). Ring wear and loss may lead to incorrect estimates of survival since individuals are no longer recognisable, resulting in overestimates of mortality in mark-recapture analyses (Sandvik et al. 2005; Juillet et al. 2011). These issues are becoming especially pertinent as studies are increasingly utilising long-term datasets of marked individuals to estimate survival (Méndez et al. 2018; Allen et al. 2019). The rates of ring wear and loss may vary among and within species depending on behaviour and habitat (Harris 1980). Rates of ring wear or loss may also depend on the material used or the background colour of the ring, for example plastic colour-rings generally wear at faster rates than steel or aluminium rings (Koronkiewicz et al. 2005; Sandvik et al. 2005; Baylis et al. 2018). Darvic colour-rings have been recommended for shorebird studies in recent years, which are made from a pressed PVCU sheet and is colour-fast, hard wearing and malleable (Ward 2000; Robinson et al. 2005). The rate of wear may also vary among plastic ring colours due to reactions with sunlight or salt water, for example, red, yellow or white may be more prone to fading than other colours (Ward 2000). Issues related to how quickly rings fade or wear are especially pertinent for long-lived species given that the probability that a ring becomes lost or worn will increase over time. A key assumption of mark-recapture models like the Cormack-Jolly-Seber (CJS) model is that markers are not lost, but the assumption is rarely tested in field studies. Tests for the underlying assumptions of CJS models are of general interest, especially for long-lived species of vertebrates where annual mortality rates are low. A general challenge remains in disentangling the impacts of ring loss and emigration on survival estimates (Conn et al. 2004; Reynolds et al. 2009). Studies oriented towards estimating rates of ring loss have reported neck-band loss of 3.2% per year for Pink-footed Geese (Anser brachyrhynchus; Clausen et al. 2015), tag loss of 5.8% for Ring-necked Parakeets (Psittacula krameri; Senar et al. 2012), loss of metal rings of 1.5% per year for Razorbill (Alca torda; Lyngs 2006), whilst loss of colour-rings is anticipated to be very low in shorebirds but this has been rarely quantified (Ward 2000; Bearhop et al. 2003). Recent studies have recommended increasing the use of colour-rings in shorebird research projects to improve the precision of demographic estimates (Robinson et al. 2005; Meissner and Bzoma 2011) and it is therefore important to quantify the potential impacts of ring wear and loss. Furthermore, volunteers, birdwatchers and the general public have become more involved in research studies through citizen science projects, and often encounter birds with worn or lost rings. Determining observer behaviour may be important for understanding the quality of observations of birds with lost or worn rings, and suitable tools should also be made available to appropriately record information about birds with worn or lost rings. The Eurasian Oystercatcher (Haematopus ostralegus) is a wading and meadow bird that has been extensively studied and during the twentieth century more than 175,000 oystercatchers have been fitted with metal rings in the United Kingdom (Euring 2016; https://euring.org/data-and-codes/ringing-totals) and 90,000 in the Netherlands (Euring 2009). 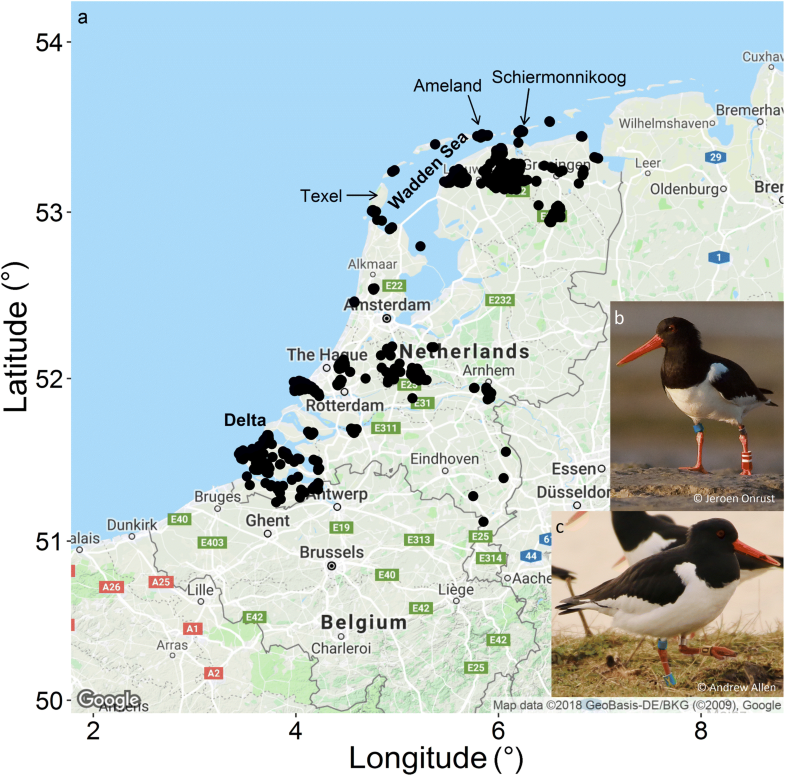 A number of research projects have colour-ringed oystercatchers, often within a geographical region of interest such as the Wadden Sea islands of Texel and Schiermonnikoog in the Netherlands (van de Pol et al. 2006; Rutten et al. 2010) or Skokholm island and the Exe estuary in the United Kingdom (Safriel et al. 1984; Durell 2007). The resulting data have proved important for determining survival and migration of oystercatchers across Europe (Durell 2007; Duriez et al. 2009). To complement existing colour-ringing projects in the Netherlands, a substantial effort has been made in recent years to expand the scale of ringing operations to include all regions and habitats of the Netherlands. The initiative, which was motivated with an aim to understand the causes of the ongoing decline, began in 2008 with “The Year of the Oystercatcher”, organised by non-governmental organisations BirdLife Netherlands and Sovon Dutch Centre for Field Ornithology (Ens et al. 2011). A core component of the initiative has been to engage with citizen scientists, and as a result, citizen scientists have been responsible for most ringing and resightings in the last ten years in the Netherlands. Our study aims to estimate how ring wear and loss may bias the results of mark-resighting analyses. Oystercatchers have been colour-ringed for over 30 years in the Netherlands providing a long-term dataset that enables analyses about the impacts of ring wear and loss. By using information provided predominantly by citizen scientists, we aim to characterise how rates of ring wear and loss may vary over time and whether these rates vary according to ring colour. We estimate the annual rates of ring wear and loss, i.e. the percentage of newly reported worn or lost rings in relation to the number of oystercatchers with colour rings, to provide an indication about the perceived loss of birds from the ringed population. Moreover, we also estimate the proportion of oystercatchers with worn/lost rings that continue to be resighted even though ring combinations are no longer legible. Rates of ring wear/loss, combined with varying probabilities of resighting, may have different impacts on mark-recapture studies, hence we simulate four scenarios of ring loss and resightings to determine how estimates of survival and resighting probabilities may be impacted. To our knowledge, ring wear and loss has not previously been quantified using citizen science observations and hence our analysis provides a novel approach to analysing ring wear and loss. We discuss the merits of this approach and how data collection can be improved in future to facilitate analyses of ring wear and loss in future mark-resighting studies. Oystercatchers have been fitted with colour rings in more than 30 ringing areas within the Netherlands, including the Wadden Sea estuary which is located in the north of the Netherlands, the Dutch Delta estuary which is located in the south-west of the Netherlands, and during the breeding season in several inland locations (Fig. 1a–c). Colour-ringing projects were restricted to the Wadden Sea islands of Ameland, Schiermonnikoog and Texel prior to 2008 but expanded to include the Dutch Delta and inland areas from 2008 onwards. Ringing operations have principally been performed during summer when oystercatchers can be caught on the nest, although oystercatchers have also been caught during winter using cannon or mist nets. An engraved colour-ring was fitted to both the left and right leg (tarsus), and a non-engraved colour marker was also attached (tibia) together with a standard metal ring (Fig. 1c). The engraved rings generally consist of two layers, the outer layer consisting of the coloured material which is engraved to a depth that exposes the inner layer which is either black or white (Rees et al. 1990; Ward 2000). The material of the inner layer may vary, for example Ward (2000) described Perspex or other acrylic plastics whilst one of the leading suppliers for Europe (Interrex; www.colour-rings.eu) described a multi-layered impact acrylic (PMMA) material. Manufacturing practices have changed over time, not only in the material used but also in ring thickness and the depth of engravings (Rees et al. 1990). Unfortunately, the history of rings used during our study has not been recorded and hence we were unable to investigate ring wear in relation to the ring material. The non-engraved colour marker may be one of four colours, black, green, red or yellow. The engraved rings may be one of eight ring colours, including black, blue, green, lime, orange, red, yellow and white, and were engraved with one of 17 letters (A, B, C, E, G, H, J, K, L, N, P, Q, S, T, W, Y, Z). The engraved rings on the left and right leg would have a different colour each (i.e. not the same colour on each leg) but the letters could be the same (e.g. Left = red A, right = yellow A). The legs of adult oystercatchers may vary in colour from a pinkish to a more reddish hue, whilst the colour of juvenile’s legs is blue-grey. Researchers on Schiermonnikoog use colour rings with a barcode system (Fig. 1b). The barcode system may be more difficult for citizen scientists to learn, but from greater distances the barcode is easier to decipher once observers become accustomed to the ring style (pers. obser.). Our analysis focuses on observations made between 2008 and 2017, but includes individuals that were ringed prior to 2008. The reason we focus our analysis from 2008 onwards is that the volunteer outreach project in 2008 coincided with the launch of a website called Wadertrack (www.wadertrack.nl) which provided a portal to enter observations of colour-ringed oystercatchers. At a minimum, the web-portal records the ring information, the co-ordinates of the observation and the date of the observation. A graphical help tool is built into the website to help observers generate the required colour code whereby the observed colour-markers can be dragged onto the appropriate parts of the leg and hence reduces the risk of incorrectly reported colour-codes. Additional information about the observation can also be provided, and importantly this included a data field where the condition of the rings could be noted. The options include no wear, worn but easy to read, worn but hard to read, ring lost and ring moved (e.g. if a ring moves from the tibia to the tarsus). However, the ring condition applied to all rings and it was not possible to report the status of each ring separately, i.e. the information was only collected at the individual level. Therefore, we do not distinguish between individuals that have worn/lost one, two or three rings, but instead, we define an individual to have a lost/worn ring when any ring has been lost or worn. In addition, in the event of a lost or worn ring, a data field was also available to enter the number of the metal ring (complete or partial). In total, 7069 oystercatchers were ringed between 2008 and 2017, and an additional 1840 oystercatchers were observed between 2008 and 2017 that were ringed prior to 2008. In total, 118,071 observations were made between 2008 and 2017 of 7469 colour-ringed individuals (Table 1) and 2.3% (n = 2808) of observations were not matched to an individual in our database for reasons that include observations of internationally ringed birds (e.g. UK, Denmark, Iceland etc. ), incomplete colour codes which may be due to ring loss, wear or the observer was unable to read all the rings, or potential errors made when reading the ring. We examined the information provided on Wadertrack to estimate approximate rates of ring wear and loss. We also identified all observations that were incomplete and by using the information provided on Wadertrack, we determined whether the incomplete observation was due to ring wear/loss or observation-related challenges (e.g. roosting oystercatcher on one leg or poor weather conditions). In many instances, even though a ring may be heavily worn or lost, an individual could be identified by the metal ring or another identifiable feature, for example fidelity to a certain area or a morphological feature like an unusual plumage or leg deformity. Therefore, to estimate the number of individuals with worn/lost rings, we included both individuals that could be identified (i.e. Known IDs) and also incomplete observations that report a worn or lost ring but the individual could not be identified (i.e. Unknown IDs). Distinguishing between Known and Unknown IDs provides an indication of the proportion of birds with worn/lost rings that are identifiable. Furthermore, the same individual may be reported on multiple occasions, for example if one observer is able to read a metal ring (thus Known ID), whilst a second observer is only able to read the colour rings and thus provides an incomplete observation (Unknown ID). Unknown IDs may also contain multiple observations of the same individual, given that we cannot distinguish between two observations of one bird with a lost ring, or two observations of two birds with lost rings. Hence, including Unknown IDs likely provides an overestimate of ring wear/loss and thus provides a precautionary approach for estimating the scale of ring wear and loss. We related the number of individuals reported with a worn or lost ring for the first time to the cumulative number of colour-ringed individuals to estimate the annual reporting rate of ring wear or loss (alpha; Table 2). We also corrected the cumulative number of ringed birds with an annual survival of 90% to incorporate mortality in the population (Table 2; Ens and Underhill 2014). To avoid potential distortions resulting from variation in survival amongst adults and juveniles, we only included birds ringed as adults in the analysis (n = 4206). When an individual had a worn or lost ring, we only included the first year that the ring was reported worn or lost to avoid multiple entries for the same individual. In a mark-recapture analysis, a heavily worn or lost ring would often mean that an individual becomes non-identifiable and hence a perceived mortality (Juillet et al. 2011). Since an individual can only be perceived to die once, we did not want to bias our estimates for rates of ring wear and loss by including multiple entries of ring wear/loss for the same individual. However, it is likely that resighting rates of birds with worn rings were higher than lost rings. Therefore, if a bird first had a worn ring, and then later a lost ring, both entries were included in the analysis, for example, if a ring was reported worn in 2012, and then lost in 2015, both would be included in the analysis. However, if a bird first lost one ring, and then it lost the other ring, we did not include a second entry since the individual would already belong to the “lost ring” category. We performed two additional analyses for oystercatchers that were known to have a worn or lost ring. In both analyses, we identified the first observation where an oystercatcher was reported with a worn or lost ring. The first analysis removed all subsequent observations made by the observer that first reported the ring as lost or worn. We then estimated the proportion of oystercatchers that were resighted even though the ring was worn/lost (beta; Table 2), and of the resighted individuals, did other observers also report that the colour ring was worn or lost (epsilon; Table 2). The first analysis focuses on whether an individual oystercatcher was reported by other observers, but an oystercatcher could be resighted ten times but only be reported with a lost ring once. Therefore, in the second analysis, we performed our analysis at the observation-level and estimated the proportion of all future observations that also reported the ring as worn/lost (gamma; Table 2). Some individuals (n = 42) had the worn/lost ring replaced hence we only focused on observations between the date that a ring was first reported worn/lost and the date that the ring was replaced. We estimated the probability that an oystercatcher was reported with either a lost or heavily worn colour-ring in relation to the age of the ring (years since the ring combination was fitted) and the colour of the ring (theta; Table 2). We performed the analysis using a generalised linear model (GLM) with a binomial response of either 1 = ring worn or lost, or 0 = ring not reported worn or lost and fitted an interaction term (*) between the colour of the ring and the ring’s age. We only included resighting data up to and including the year that an individual was first reported with a worn or lost ring to avoid complications resulting from observers not including information about the condition of the ring (e.g. a ring may be reported lost in 2012, but not in 2013, even though the ring was known to be lost, which would consequently skew probability estimates of the binomial model). In addition, some individuals had their rings replaced when they became worn or lost. In some instances, these were easy to identify because the individual received a new ring combination, and thus the age of the individual’s ring combination would reset to zero. However, information was not recorded if an individual’s rings were replaced with the same combination and thus the age of the ring combination may not accurately reflect the true age of the rings. Our analysis only focused on the engraved rings and excluded the colour markers on the tibia (Fig. 1; Additional file 1: Appendix A). Since all individuals (excluding those with barcode rings) have an engraved colour-ring on both legs, and generally it was not recorded which colour-ring had been lost or was worn (some citizen scientists included information in a comments field), we replicated the data so that the colour-rings from both legs were included in the analysis (i.e. each individual had two entries). Including the rings from both legs would ensure that all ring colours were evenly represented. To verify our approach of combining rings from both legs, we performed two additional analyses (Additional file 1: Appendix A). Instead of combining the rings from both legs, we analysed ring wear and loss for each leg, the results of which are described in Additional file 1: Appendix A. In a second analysis, we only included individuals where the lost or worn ring was known, although this resulted in a much reduced sample size (Additional file 1: Appendix A). We also estimated how habitat may influence the probability of ring wear and loss, although we defined habitat by describing three broad areas within which individuals were ringed. Our areas were the Wadden Sea, Inland and the Delta (Fig. 1). All individuals were classified to an area based on the ringing location (Table 1). Inland birds largely forage in grasslands during summer but will migrate to coastal regions during winter although in many instances the wintering location is unknown (Allen et al. 2019). Oystercatchers are frequently observed foraging on oyster beds and stone dikes in the Delta region, which may damage rings, especially on the tarsi. The Wadden Sea is a large inter-tidal area of mudflats with a diverse array of habitats within which oystercatchers may forage. We considered models with habitat alone, and with habitat as interaction term with time and/or ring colour, and selected the top performing models based on AIC. 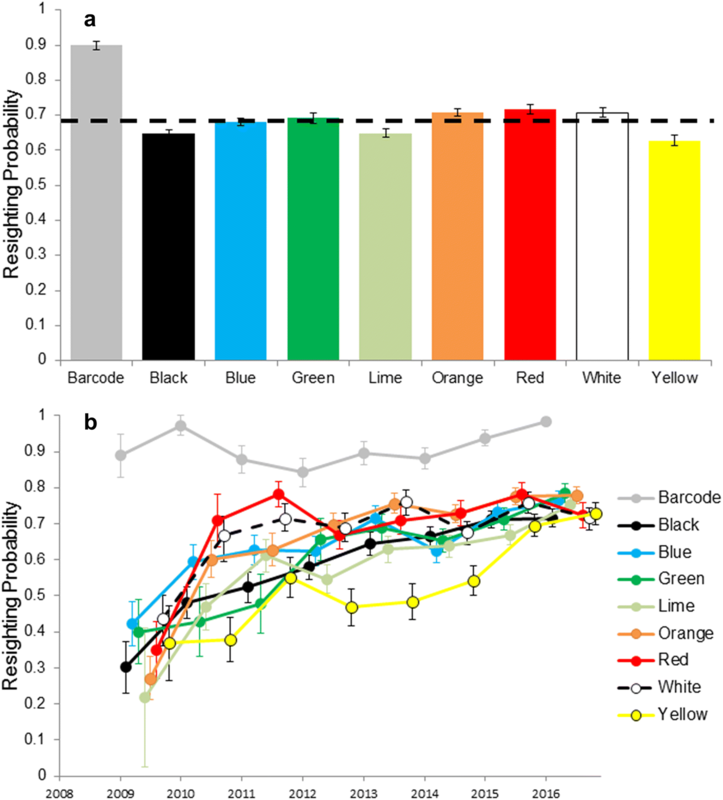 To investigate colour-specific ring wear, we determined whether resightability varied amongst ring colours in a mark-resighting analysis with individuals divided into groups according to their ring colour. Note that an individual may belong to two groups if it had two different engraved colour-rings, which most individuals had. Since ring colours on each leg were not independent (i.e. the detection of one ring may be influenced by the colouration of the ring on the other leg), the resighting probability may be influenced by the ring combination. Therefore, in addition to a model structure that contained each of the eight ring colours independently, we also included a model structure with the ring combination to identify general patterns of detectability, for example whether ring combinations of yellow/black have a different resighting rate than yellow/red (Additional file 1: Appendix B). Researchers on Schiermonnikoog use a bar-code system for rings which we did not divide by colour but instead group this class of rings as “Barcode”. The sampling period was from April to June inclusive, when oystercatchers are on their summer breeding ranges. Although mark-recapture models are generally designed for instantaneous sampling, a large portion of our data would be lost if we excluded citizen science observations. Therefore, we used a non-instantaneous sampling design, with observations collected over a three-month period. Previous research has indicated that mark-recapture models can be robust to violations of the assumption of instantaneous sampling, and non-instantaneous sampling may actually improve the precision of results (O’Brien et al. 2005). In the mark-resighting analysis, we considered model structures that either held resightings and survival constant over time or allowed these to vary over time. We performed the analysis in Program Mark (White and Burnham 1999) but developed the model using the package RMark (Laake 2013) in R 3.4.1 (R Core Team 2017). Scenarios three and four compared two mechanisms for how individuals with lost rings may be observed by citizen scientists in the field. The differences may appear subtle, but the implications for a mark-recapture analysis may vary between the two scenarios. As an example, in scenario three, two individuals (A1 and A2) with lost rings will have an equal resighting probability (70%). Hence, over ten years of sampling, both birds are observed seven times but because of the lost ring, only 50% of the observations were identifiable (3.5 times). In scenario four, using the same two individuals (A1 and A2) but now individual A1 is never resighted during the entire 10 year study period because of the lost ring, whilst individual A2 has a 70% resighting probability and individual A2 is identifiable despite the lost ring. We generated a mark-recapture history for these four scenarios and performed our analysis using the Cormack-Jolly-Seber mark-recapture model in Program Mark (White and Burnham 1999), through RMark (Laake 2013), to compare estimates for the survival and resighting parameters of each model scenario. To validate the simulation, we compared models with time-varying survival and resighting probability, however since we kept survival (90%) and resighting (70%) constant, the time independent model should perform best. The annual reporting rate of oystercatchers with lost rings (alpha) was below 2% at the start of the project, rose to 3% by the end of the project, and may even be as high as 6% when applying annual survival of 90% to the cumulative number of colour-ringed birds (Fig. 2a). The annual reporting rate of oystercatchers with worn rings (alpha) was approximately 1% per year (Fig. 2b). From observations of birds with worn/lost rings, 58% had a Known ID whilst 42% had an Unknown ID and most of the Unknown IDs related to lost rings (90%) compared with worn rings (10%; Fig. 2). The number of individuals reported with a lost ring, that could still be identified by the metal ring or other recognisable features, totalled 373 (Table 3). Forty-seven percent (175/373) of individuals were resighted by observers other than the observer that first reported the lost ring (beta; Tables 2, 3), and 47% (83/175) of these individuals had at least one observation that noted the ring was lost (epsilon; Table 2). The number of individuals reported with a worn ring, that could still be identified, totalled 359 (Table 3). Seventy percent (253/359) of individuals were resighted by observers other than the observer that first reported the worn ring (beta; Tables 2, 3), and 30% (75/253) of these individuals had at least one observation that noted the ring was worn (epsilon; Table 2). Of the 75 observations that noted a worn ring for the first time, orange and yellow rings were less likely to be reported by subsequent observers (other than the initial reporter) as worn (20%) whilst lime (38%), white (36%) and red (36%) were more likely to be reported as worn, although a Pearson’s Chi squared test for equality of proportions indicated that the differences between these colours were not statistically significant (χ2 = 10.6, df = 8, p = 0.22). The proportion of future resightings that included information that a ring was worn (gamma; Table 2) was only 10.3% (448 of 4331 observations) and for lost rings it was 31.2% (1310 of 4194 observations; Table 3). The probability that an individual was reported with a worn or lost colour-ring increased with the age of the colour-ring (Fig. 3). Red and white colour-rings had higher rates of wear, such that after 15 years the probability of a worn red or white ring was 24.6% (SE = 4.6%) and 16.0% (SE = 3.3%) respectively, compared with an average probability of 9.2% (SE = 3.2%) for the other ring colours (excluding barcode rings; Fig. 3a). The probability that an individual was reported with a lost ring averaged 6.51% (SE = 4.02%) after 15 years (Fig. 3b). It appears that ring-combinations with black rings were more likely to be reported lost (Fig. 3b), although the probabilities were very similar amongst ring colours, especially when analyses were conducted on each leg, or where the lost ring was known (Additional file 1: Appendix A). Barcode rings had a lower probability of being reported as worn or lost in the first 15 years after the colour-ring was fitted (Fig. 3). The probability of the colour marker (i.e. non-engraved ring) becoming worn or lost appeared to be low. Less than 2% of individuals reported with lost or worn rings had a ring marker that became worn (n = 5) or lost (n = 8, Additional file 1: Appendix A), of which yellow markers appeared to be more prone to wear (n = 3) and loss (n = 4). Similarly, the probability of losing both rings was also low, and only 2.1% of individuals that had lost a ring, lost both rings (Additional file 1: Appendix A). Analyses focused on rings that were on either the left or right leg also indicated that red rings wore at faster rates than other rings, but the rankings for other ring colours varied depending on which ring (left or right) was included in the analysis (Additional file 1: Appendix A). The top performing model that included habitat (i.e. study region) contained the same structure for both ring wear and ring loss, with an interaction (*) between habitat and ring age (Table 4). The rates of ring wear and ring loss were significantly lower in the Inland and Wadden Sea regions compared to the Delta. The increasing age of a ring combination resulted in an increasing probability of an individual having a lost (β = 0.322) or worn (β = 0.235) ring, whilst individual’s ringed in the Delta had a higher probability than individual’s ringed in the Wadden Sea or Inland (Table 4). The top performing model had a structure that included survival that varied by time, and resighting probabilities that varied with an interaction term between the ring colour and time (i.e. colour:time; Fig. 4). The top model outperformed the second ranked model (∆AIC = 9.27) containing the ring-combination to correct for the non-independence of the rings on each leg (Additional file 1: Appendix B). The mark-recapture analysis indicated that the resighting probability was similar amongst ring colours with an overall average of 0.68 (excluding the barcode ring; Fig. 4a). Yellow colour-rings had a lower resighting probability (0.63, SE = 0.02) compared with red (0.72, SE = 0.01) colour-rings (Fig. 4a). Barcode rings had the highest resighting probability at 0.90 (SE = 0.01). The resighting probabilities of all the coloured ring colours increased during the study period and had similar resighting probabilities by the end of the study period (Fig. 4b). Compared to the average resighting probability of a ring colour, rings that were combined with black or yellow rings tended to have lower resighting probabilities, whilst rings combined with red or green rings tended to have higher resighting probabilities (Additional file 1: Appendix B). The mark-recapture simulation aimed to quantify the potential impact of ring loss in our study population under different scenarios of how birds with lost rings are reported. The business as usual scenario provided survival and resighting probability estimates that were very close to the simulated value of 0.90 and 0.70 respectively (Table 5). A scenario of complete ring loss reduced survival to 0.88 whereas scenarios three and four had varying impacts on the mark-recapture analysis, with scenario three resulting in reduced resighting probability and scenario four resulted in reduced survival (Table 5). Our study provides important insights to how issues relating to the loss and wear of colour-rings may impact demographic estimates of mark-recapture studies. Annual rates of ring loss may be as high as 6%, which would have a significant impact upon mark-recapture survival estimates, especially for a species like the Eurasian Oystercatcher which has high survival (van de Pol et al. 2010; Duriez et al. 2012). Annual reporting rates of ring wear were much lower at approximately 1% although our results indicate that the probability of an observer reporting a worn ring was three times lower than reporting a lost ring. The probability of a ring becoming lost or worn was strongly dependent on time with very low rates of ring loss or wear in the first years after the ring was fitted. The initially low rates of ring wear would indicate that especially ring wear may be less of an issue for colour-ring studies of shorter-lived species, but may become an issue for long-lived species like the oystercatcher with longevity records exceeding 40 years (van de Pol et al. 2014). Our results indicated that resighting rates were comparable amongst ring colours but that red and white-coloured rings may wear more quickly than other colours. Our analysis also highlights how the enthusiasm of citizen scientists to identify colour-ringed oystercatchers may reduce the impacts of lost rings since approximately 50% of individuals with lost rings were repeatedly observed and identified, and this figure is likely higher as it is unknown how many observations of Unknown IDs were duplicates of the same bird. Studies have previously quantified rates of ring loss using information from mass capture events like mist or cannon nets (Conn et al. 2004; Juillet et al. 2011) but this was not possible in our study because the information was not recorded. Unfortunately, information about why rings were replaced was also not recorded, which is why we relied upon the information provided with resightings on Wadertrack. An advantage to this method is that estimates of ring loss would not be spatially biased to those areas where mass-capture events occur, in our case the sample would be limited to the Wadden Sea area (Fig. 1). The large sample size enabled us to characterise ring loss and wear over time and generate probability estimates for different ring colours and time periods, for example how red-coloured rings had a high probability of being worn after 15 years. To our knowledge, our study is the first to quantify rates of ring loss using predominantly citizen science data, and we believe that this information may prove useful for existing colour-ring studies and also when designing future studies. However, we also encountered a number of challenges related to the ring-fitting process and how data was collected. Therefore, we have developed several recommendations related to ring fitting, data collection and study design, and mark-recapture analyses that should guide future studies that use colour-rings (Table 6). The probability that an observer included information about a lost or worn ring was quite low (47% and 30% respectively), and even lower when considering the observation level (37% and 10% respectively). The analysis assumed that the first observer correctly reported a ring as lost or worn and hence some variation is likely due to observer behaviours. To improve how the information about ring wear and loss can be used in future, it would be helpful to provide a training document for observers (Table 6). A training document could emphasise the importance of reporting lost or worn rings every time an individual is seen, and a questionnaire could also help resolve uncertainties about observer behaviours. An example is whether observers always report a ring that is lost or worn, even if the ID cannot be determined (Table 6). Ring wear is also subjective, and observers may have different baselines for ring wear. As an example, in a recent event, we asked an audience (composed of volunteer ringers and ring-readers) to score the ring wear status of 13 images (details provided in Additional file 2). No images had 100% consensus for the degree of ring wear, and only 5 images had more than 80% consensus, and these tended to have extreme ring wear (4 of 5 images; Additional file 2). We only describe an opportunistic survey and thus recommend a more detailed questionnaire to determine how observers report ring wear and which levels of ring wear tend to be uncertain. The results of the survey could subsequently be used as training for future observations (Additional file 2; Table 6). Ring loss appears to be a greater issue than ring wear, with annual rates of ring loss averaging 2.5% and approached 6% by the end of the study whilst ring wear was less than 2%. Given the high survival rates of oystercatchers (0.85–0.95; Duriez et al. 2012; Roodbergen et al. 2012), the current rates of ring loss may have a large impact on mark-recapture and survival studies (Conn et al. 2004; Reynolds et al. 2009). To illustrate the effect of ring loss using the results of our mark-recapture simulation (Table 5), if true survival is 90% but apparent survival is 87.7% because of ring loss, the expected life expectancy of an adult oystercatcher would reduce from 9.5 to 7.6 years and would thus have a large impact on demographic studies. However, our additional analyses indicate that the potential impacts on survival estimates may be much lower. The individual ID was known for over 50% of observations reporting ring loss (Fig. 2) and depending on the observation patterns of individuals with lost rings, our mark-recapture simulations indicates that the impacts on survival estimates may be 1% or lower when applying an annual average rate of ring loss of 2.5% (Table 5). Increasingly studies are integrating mark-recapture data for shorebirds that cover long time series and different locations (Méndez et al. 2018; Weiser et al. 2018). We have shown that rates of ring loss may accelerate over time, which has implications for long-lived species, and that the effects on survival will vary depending on how individuals with lost rings are resighted. Implementing some of our suggestions in Table 6 may help future studies overcome some of these challenges and guide future development of ringing projects, especially when these are integrated in citizen science programs. We did not detect large differences in the resighting probability of colour-rings, and after ten years the resighting rates remained similar among all colour-rings (Fig. 4). Previous studies have indicated some colour-combinations may be more difficult to decipher (Baccetti and Morelli 2009), although Mitchell and Trinder (2008) indicated that observers generally reported the ring colour correctly. The rate of ring wear may vary amongst ring colours (Ward 2000; Collins et al. 2002) and we confirmed this in our study. Most rings wore at a similar rate, but the red and white rings, and perhaps yellow, appeared to show higher rates of wear (Fig. 3). The rates of ring wear may also be slightly underestimated since it is likely that not all individuals with worn or lost rings were identified. Given the low reporting rates of worn rings, and the long time-period before rings become worn, the effects of ring wear on survival analyses are likely to be low, especially compared to ring loss. The effects of ring wear may be reduced even further by encouraging the ever-growing citizen science network that is involved with bird-ringing to catch breeding birds on the nest, which can be done with relative ease (Ens et al. 1992), to pre-emptively replace rings that are lost or worn (Table 6). Researchers on Schiermonnikoog would pre-emptively catch birds with a barcode ring that began to show signs of wear. Since barcode rings had low rates of wear and loss, this strategy may be effective in reducing problems with ring wear and loss. A topic that has not been addressed in our study is the type of plastic used to produce the colour-ring, and how this may impact how the ring is fitted, colour-specific ring wear and rates of ring loss (Rees et al. 1990; Ward 2000). Unfortunately this information was not recorded during our study and motivated some of the recommendations we make in Table 6. Cataloguing ring combinations with information related to the type of plastic for both the inner and outer layers, plastic thickness and depth of engravings would inform how rates of ring wear and loss may vary due to ring manufacture (Table 6). Rates of ring loss appear to be higher for oystercatchers ringed in the Delta (Table 1). Oystercatchers in the Delta were often observed feeding on oyster beds and stone dikes (unpubl. data) which may increase the rate of wear. The rate of ring degradation may also be influenced by other factors in the environment, such as chemicals that the ring comes into contact with (Collins et al. 2002). In contrast, the rates of ring loss for oystercatchers ringed inland were very low, and highlights the importance of comparing habitats when evaluating causes of ring wear and loss. Although the proportion of worn rings were highest in the Wadden Sea (Table 1), the average age of colour-rings were much higher in the Wadden Sea. The spatial variation in rates of ring loss and wear may influence apparent survival estimates for Oystercatchers, especially in the Delta where survival may be underestimated due to high(er) rates of ring loss. Studies focusing on large geographical areas should consider this spatial variation. Our results are not only transferable to studies of large geographical areas, but also to multi-specie studies since species may use different habitats (Méndez et al. 2018; Weiser et al. 2018). Our study is amongst the first to investigate the impacts of ring wear and loss of a long-lived shorebird using citizen science observations, allowing comparisons over a large spatial scale and near-continuous data collection through time. Although rates of ring loss may be as high as 6%, potential duplicate observations, and the fact that the ID of an oystercatcher with a lost ring was known for over 50% of observations, our analyses indicate that the impacts of ring loss were probably much lower and lie between 1 and 2%. Future mark-recapture studies should consider these impacts when reporting survival estimates, as a rate of 2% is still important for a long-lived species like the oystercatcher that typically has annual survival above 90%. We recommend that future studies incorporate appropriate systems for citizen scientists to report worn or lost rings and to also train citizen scientists to always report any observations of birds with lost or worn rings to improve the accuracy of analyses (Table 4). The probability that a ring was reported as worn was quite low which may be due to the uncertainty of how to report worn rings. As a remedy, training tools and websites/apps could provide built-in examples that display levels of ring wear so that determining ring wear is less subjective for the citizen scientist. Although several oystercatchers with lost rings could be identified, the information about which ring was lost could not be recorded on the data-entry website/app even though this was clearly known. Including the information about which ring was lost would help improve estimates and may improve our ability to detect differences among ring colours. In addition, most individuals with a lost ring were likely identified by the metal ring and including a second identifiable feature, such as an engraved flag (Roche et al. 2014), would improve estimates of ring loss. BE, MP, KO and JN collected and managed the field data. AA, BE and EJ conceptualised the research but all authors contributed to its development. AA performed the analyses. AA drafted the manuscript and BE, EJ, HJ, HK, JN, MF and MP revised and contributed to the final draft. All authors read and approved the final manuscript. This research forms part of a larger project called the Cumulative Human Impacts on biRd Populations (CHIRP; www.chirpscholekster.nl, http://andrewmallen.weebly.com/) which investigates how spatio-temporally varying threats impact the Eurasian Oystercatcher population. Please see our website or contact the corresponding author if you would like more information. We would like to thank all volunteers and researchers, as listed in Additional file 3, who assisted with ringing and observing oystercatchers in the field. We would also like to thank Verónica Méndez, Brett Sandercock and one anonymous reviewer for their comments which improved the manuscript. Funding was provided by the Applied and Engineering Sciences domain of the Netherlands Organisation for Scientific Research (NWO-TTW 14638) and by the Royal Netherlands Air Force, Birdlife Netherlands, NAM gas exploration, and Deltares. We acknowledge the feedback provided by ecologists working at these institutes during half-yearly meetings. Progress evaluation of the project, however, was conducted only by NWO-TTW. The handling of Eurasian oystercatchers was approved under the Law for Animal Testing (WOD; Wet op de dierproven) by the Netherlands Food and Consumer Product Safety Authority, which is part of the Ministry of Agriculture, Nature and Food Quality. Furthermore, all ringers (including citizen scientists) had to have a ringers license which is only provided after appropriate training. This research is supported by the Applied and Engineering Sciences domain, TTW, which is part of the Netherlands Organisation for Scientific Research (NWO), NWO-TTW Grant 14638. The research was also co-funded by NAM, the Royal Netherlands Air Force, Birdlife Netherlands and Deltares. Additional file 1. Appendix A: Probability of ring wear and loss (theta). Appendix B: Ring colour resighting probabilities. Additional file 2. Appendix C: Ring wear survey. Additional file 3. Extended Acknowledgements.